This winter's new stage play was the focus of this morning's updates and the details are all on the official homepage. Firstly, Nakayama Yuuki and Yamaguchi Tomoya, both of SOLIDEMO, will be joining the cast as members of Motochika's crew! It's a fun idea to bring two pop singers into the play as guest stars, and I hope it means that there will be some comical scenes (and maybe even songs?) for Aniki this time around. The two guest stars will come back on stage for a chat with the audience after the show on 29th January 2016. The update also introduced preview pictures of Masamune (Shiono Akihisa), Yukimura (Matsumura Ryuunosuke) and Motochika (Shiramata Atsushi) in costume! You can see them all over at 4 Gamer if that's easier than the Twitter links. 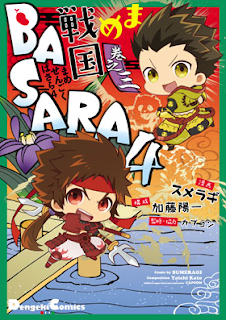 We finally have the details for the Sengoku Basara stage presentations at this month's Jump Festa event courtesy of the Capcom website. They're scheduled for Saturday 19th December 2015 from 14:30 to 15:00, and Sunday 20th December 2015 from 10:40 to 11:10. That's not much time. They're specifically being described as news presentations, and the speakers will be KobaP and Ashigaru-kun (the little blue puppet mascot character who appears at some live events). Speaking of Ashigaru-kun, he's been busy featuring in the first of a series of reports about the new dishes on offer at the Capcom Bar in Shinjuku. The initial report covers the deluxe Sengoku Basara Battle Set and attempts to explain the connections between each of the characters and the types of food on offer. It's a little silly. There will be another report posted next week to show off more of the new menu items. It's already time for the second 'Basa-ranking' fan survey. The newest poll is asking everyone for their opinions on which previous Sengoku Basara title had the best gameplay mechanics. To place your vote, visit this page and click the golden button underneath the picture of the game you want to select. You'll be asked to confirm your choice, then after a short time the game you picked will be highlighted in gold and your vote will be registered. The voting is open until noon on Christmas Day 2015 (Japan time) so don't delay! 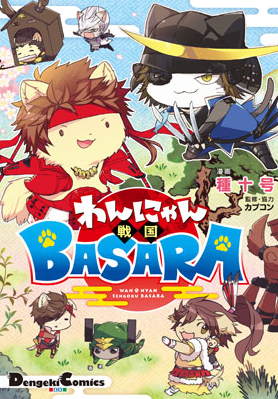 We now have a proper preview of the Wan-Nyan Sengoku Basara manga cover artwork courtesy of e-Capcom. It's looking nice and colourful! The cover artwork for the third volume of Mame Sengoku Basara 4 is also now available. It's sad to think that this will be the final book in the series. It's a shame there's no comment box so that fans can give reason for their choice. I understand why there isn't given the number of votes they're receiving but it would be fun to see a sample of opinions showing why everyone picked the winners. The Japanese leans towards implying that it's the battle system itself we're voting on, if that helps. I think that the later games have done that best, though if I could blend elements of several of the previous titles in too it would make Sumeragi even better. I really do prefer the battle system of the latest games but one thing I miss from Utage was the mini challenges. Bring them back! I'm guessing the news presentations aren't going to feature too much. It seems like lately the events are just recaps of what's already been revealed. Thinking positively if without any logic... Maybe they'll have demos of like the upcoming CD? So it might be worth tuning in to one. I hope there will be a stream from Jump Festa this year, though I hope they'll allow timeshifting if they broadcast as I think I have a conflicting date with a child who wants to see a certain blockbuster movie that weekend.